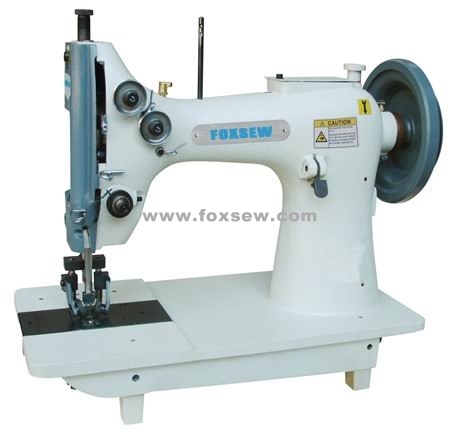 Double Needle Large Hook Lockstitch Moccasin Sewing Machine for Extra-heavy duty machine adopts large vertical rotation hook, linked-type scale. It is suitable for sewing leather, canvas, tents, waterproof fabric and all kinds of extra heavy duty materials. Used for sewing saddle, harness, safty belt, tree farm working band, outdoors tents, leatherball, gloves, mountain climbing gear, luggage etc... extra heavy duty materials. This machine utilizes bobbin winder and big rotary shuttle, especially available for sewing thick seaming work piece. Best suitable for stitching tents, seat cushions, horse gears, and gunnysacks, cars seaming and so on. Equipped with full range of parts. It could apply roller presser foot or presser foot for sewing . It could apply normal moccasin stitch or cord inserting moccasin stitch. Needle gauge could apply 7.5mm, 6.35mm, and 5.5mm for sewing. Suitable for ornamental sewing (moccasin stitch) for shoes, bags, leather goods, etc. Looking for ideal Double Needle Top and Bottom Feed Moccasin Sewing Machine Manufacturer & supplier ? We have a wide selection at great prices to help you get creative. All the Double Needle Top and Bottom Feed Lockstitch for Heavy Duty are quality guaranteed. We are China Origin Factory of Double Needle Mocca Sewing Machine. If you have any question, please feel free to contact us.